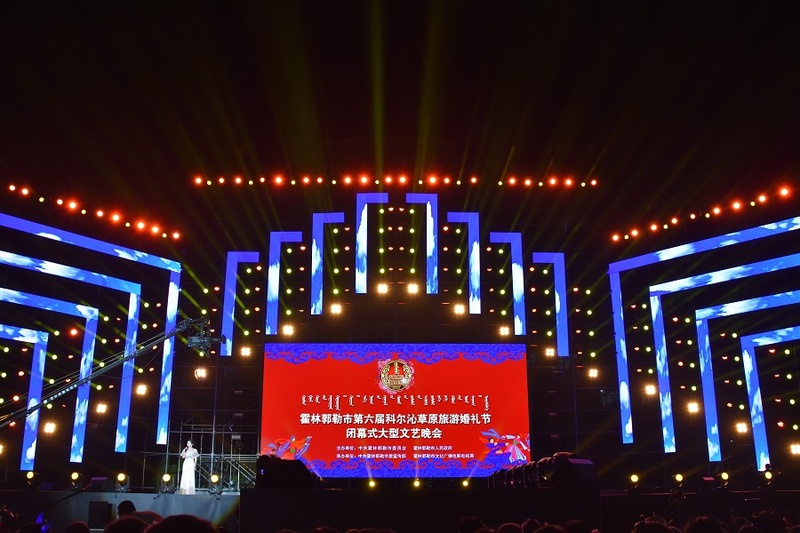 A grand culture gala entertained thousands of spectators at No 1 Middle School in Huolin Gol (Huuliin Gol), Inner Mongolia autonomous region on July 8, celebrating the close of the Sixth Horqin Grassland Wedding Festival. The organziers invited singers, including reputed Mongolian ethnic singers Husileng and Na Shun, dozens of dancers from Ulanmuchi (Ulan Muqir) art troupe, a Mongolian ethnic vocal ensemble, acrobats, and several folk and pop musicians. More than 10,000 locals and visitors gathered to see the gala, enjoying soulful singing and thrilling dance performances, so that the whole party became a spectacular audio-visual art feast. Encouraged by the hosts, Hao Di from Nigeria wore traditional Mongolian clothing to perform during the show, presenting the audience with a mix of foreign and Mongolian cultures. The event was sponsored by the Communist Party of China Huolin Gol committee, Huolin Gol government, Huolin Gol publicity depatment, and Huolin Gol administration of culture, radio, film and television. The festival has been successfully held six times, and has developed into a reputed tourism brand for the area. The three-day culture and tourism festival contained an industrial promotion fair for electrolytic aluminum, a calligraphy and painting exhibition, a Horqin grassland live wedding drama, the Mongolian Aobao ritual, and the 2018 Huolin Gol International Half-marathon. A series of activities were held with the aim of promoting economic cooperation and business trade, showcase unique ethnic customs on Horqin grassland, and achieve the high-quality development of the economy and overall social progress in Huolin Gol.